The Race Village is situated at the stunning De Hoop Collection in the De Hoop Nature Reserve. 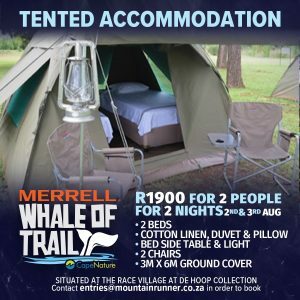 They have a number of different accommodation options available for the weekend of the Whale of Trail 2019 and will once again be offering special rates for runners and their families. Accommodation is sold on a per room basis. Friday 2nd August is Registration and Briefing, Saturday 3rd August is race day with Prize Giving at 20h00. Aside from delightful houses, De Hoop has so much to offer: Guided nature, bird and marine walks, mountain biking trails and bike rentals, eco boat trips on the Ramsar vlei, luxurious spa treatments and of course whale watching at the beach. De Hoop Collection has details of other accommodation available in the area, so please contact them should you require. Whale of Trail are offering GLAMPING tented accommodation option. Contact entries@mountainrunner.co.za for details on how to book. Wake up on the start line! We have secured the use of this facility for our runners and their supportive friends or family over the race weekend. Ideal budget option; no frills, but an awesome atmosphere created by individuals united by their common quest. 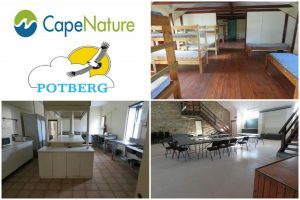 Situated right at the trail head at Potberg in the De Hoop Nature Reserve, approximately 40min drive from the main race village at De Hoop Collection. You will need to make your own arrangements for transfers between the two, but this is easily done between all who have cars there. Available for Friday 2nd August and Saturday 3rd August at a cost of R350 pppn. Two large dormitories, sleeping 20 and 40 people respectively. Ablution facilities with hot-water showers. Microwave oven, electric fridges, freezer, electric and gas stoves. Kitchen equipment such as pots, pans, preparation and serving utensils available on request. Plate, mug, cutlery, water bottle. Contact entries@mountainrunner.co.za should you wish to book beds at Potberg Enviro Centre for this time.